E-way bill requirement for Intra State movement of goods in Delhi began from 16th June 2018. Roll out of e Way Bill system for intra-State movement of goods in the States / Union Territory of Arunachal Pradesh, Madhya Pradesh, Meghalaya, Sikkim and Puducherry from 25 April 2018. 1. What is an eWay Bill? EWay Bill is an Electronic Way bill for movement of goods to be generated on the eWay Bill Portal. A GST registered person cannot transport goods in a vehicle whose value exceeds Rs. 50,000 (Single Invoice/bill/delivery challan) without an e-way bill that is generated on ewaybillgst.gov.in Alternatively, Eway bill can also be generated or cancelled through SMS, Android App and by site-to-site integration through API. When an eway bill is generated, a unique Eway Bill Number (EBN) is allocated and is available to the supplier, recipient, and the transporter. 2.When Should eWay Bill be issued? 3. Who should Generate an eWay Bill? Registered Person – Eway bill must be generated when there is a movement of goods of more than Rs 50,000 in value to or from a Registered Person. A Registered person or the transporter may choose to generate and carry eway bill even if the value of goods is less than Rs 50,000. Unregistered Transporters will be issued Transporter ID on enrolling on the e-way bill portal after which Eway bills can be generated. Note: If a transporter is transporting multiple consignments in a single conveyance, they can use the form GST EWB-02 to produce a consolidated e-way bill, by providing the e-way bill numbers of each consignment. If both the consignor and the consignee have not created an e-way bill, then the transporter can do so * by filling out PART A of FORM GST EWB-01 on the basis of the invoice/bill of supply/delivery challan given to them. Goods specifed as exempt from E-Way bill requirements in the respective State/Union territory GST Rules. Transport of certain specified goods- Includes the list of exempt supply of goods, Annexure to Rule 138(14), goods treated as no supply as per Schedule III, Certain schedule to Central tax Rate notifications. (PDF of List of Goods). Note: Part B of e-Way Bill is not required to be filled where the distance between the consigner or consignee and the transporter is less than 50 Kms and transport is within the same state. Inter-State movement of goods has seen rise in numbers of generation of eway bills ever since its implementation began from 1st April 2018. State-wise implementation of e-way bill system has seen a good response with all the States and Union Territories joining the league in the generation of eway bills for movement of goods within the State/UT. However, reliefs have been provided to people of few States by way of exempting them from eway bill generation in case of monetary limits falling below threshold amount or certain specified items. For Instance, Tamil Nadu has exempted people of its State from the generation of eway bill if the monetary limit of the items falls below Rs. One Lakh. To know more of such reliefs for other States/UTs, visit commercial tax websites for each of such States/UTs. E-Way Bill can be generated on the e-Way Bill Portal. All you need is a Portal login. For a detailed step-by-step guide on e-Way Bill Generation check out our article – Guide to generate e-Way Bill online. Validity of Eway bill can be extended also. The generator of such Eway bill has to either four hours before expiry or within four hours after its expiry can extend Eway bill validity. What is the responsibility and liability for the transporter in E-Way bill system? Transporters carrying goods by road, air, rail, etc. also need to generate e Way Bill if the supplier has not generated an e Way bill due to any reason. Generate e way bill on basis of information shared by the suppliers/ consignors regarding the Invoice/challan. To know more refer to our article on ‘Compliance on e-Way Bills by Transporter’ If the transporter does not generate in the above circumstances when he is required to, he may face penalty of Rs 10,000 or tax sought to be evaded (wherever applicable) whichever is greater, further liable for confiscation of goods and seizure of vehicle. One e-Way bill needs to be generated against the Invoice. Above situation is known as “Transshipment”. Transporter can also re-assign another transporter by updating transporter ID on the eway bill portal. Once transporter re-assigns another transporter, seller cannot make any changes to assigned transporter. So, the user has to generate different delivery challans against the invoice based on the different Transporter ID, because different e-way bills against a single invoice is not possible and will also cause the problem in populating the data in the GSTR-1. Value of consignment of Goods” is interpreted as follows: 1. Invoice Value* exceeds Rs. 50,000 OR 2. If a vehicle carries goods against multiple Invoices, then where the aggregate Invoice value* exceed Rs. 50,000 So, if either of above points is satisfied, the user should generate e-Way Bill. *Invoice Value means transaction value as per Invoice inclusive of all the taxes excluding the Value of exempt goods that are being carried along the taxable goods and billed together. Does import and export under GST involve e-way bills?.. 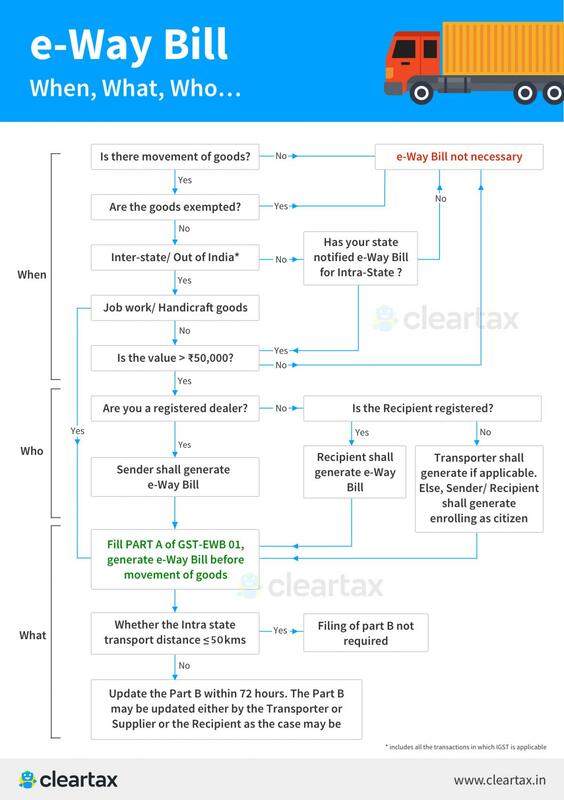 if yes, When and How to generate e-way bill? All queries answered here with specific scenario. Suppliers and Transporters can now use 'Change to multi-vehicle' option enabled on the e-way bill portal. Learn when to use this option & here is a step-by-step guide how to use the same. Here are the steps to generate and manage e-way bills for Citizens. Citizens being any unregistered under GST and are the end-consumers of goods being transported or moved may require sometimes to generate e-way bills, when not by suppliers/vendors. Special Economic Zone developer or Special Economic Zone unit is considered to be an Inter state supply and Integrated Goods and Service tax (IGST) will be applicable. Just like the others, SEZ's too are covered for GST and EWB. Read on to know more about GST and EWB implications on SEZ's.. Logistics holds key to e-commerce industry growth E-way bill is expected to solve issues of inter-state movement of goods & long queues at check posts. Many goods are kept out of scope of eway bill. Not only that but several movements of goods are exempted too. Read to know more. GST Eway bill Transportation of Goods by Railways, details of the transport document number (RR number) with the date of the document should be provided. Telangana is one of few States, that are following an intermediary system where e-way bills for movement of goods within State is being implemented. Use IRN -Invoice reference no. as an alternative to invoice while moving goods. It helps avoid paper-work and risk of loss of tax invoice while in transit. What happens if one is liable but does not generate or carry eway bill for movement of goods? Know about the Consequences and penal provisions of the same. 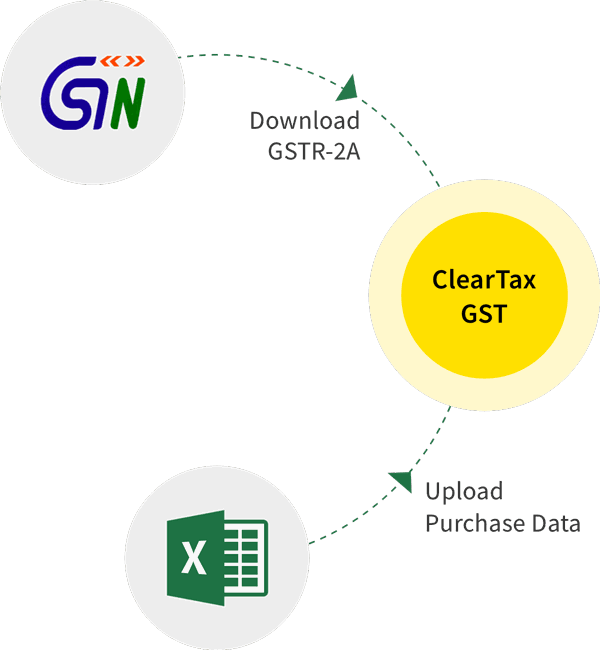 Get your GST Eway Bill queries resolved with ClearTax FAQ Search. You can also ask question to our support team. Contents of form EWB-01 explained in detail along with FAQs. The step-by-step process of registration on the e-Way Bills portal for both registered and unregistered suppliers/ transporters is dealt here. How to use Bulk Generation facility on the E way Bill portal? 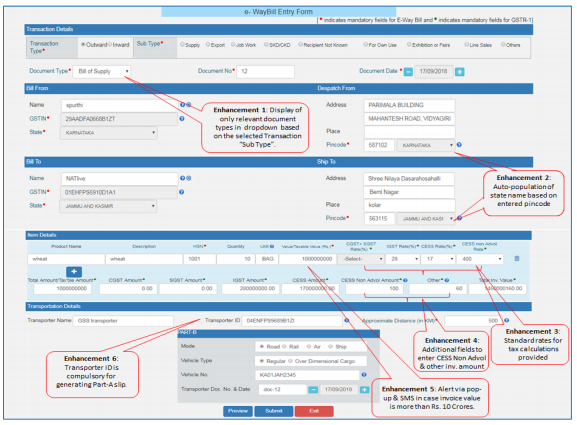 Business houses/Logistics can use these steps for preparing and uploading the file on the e-Way Bill portal to bulk generate e-Way Bills in one shot. How to generate Consolidated Eway Bills on the E Way Bill portal? With the advent of GST, the Indian logistics industry is also set to undergo an overhaul. Will e-way bills be the panacea to the woes of this sector? E-way bill rules for Transporter. Mandatory documents to carry with consignment. Rules of vehicle stoppage and document verification during journey.